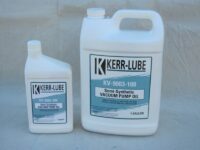 Kerr Pump & Supply offers the pump lubricants and oils you need to keep your pumps running smoothly and retain your manufacturer’s warranties. Need help choosing? We’d be glad to help specify the right lubricant. Kerr-Lube Vacuum Pump Oil KV-9003-100 is a custom formulated lubricant designed for long life while dealing with severe, demanding conditions encountered in recirculating systems like rotary screw compressors and vacuum pumps. It also has very low vapor pressure that makes this a perfect lubricant for vacuum applications. 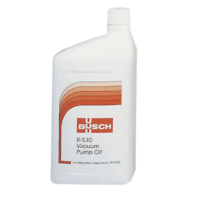 Busch Vacuum Pump Oils are mechanical vacuum pump oils for Busch R5 rotary vane pumps. CPI Engineering Services Lubricant is a high performance synthetic lubricant for most industrial applications including lubricants for gear, hydraulic and vacuum applications. Used for high speed, high temperature chain applications. This synthetic based lubricant provides a high viscosity index, high film strength and excellent shear resistance. Tuthill Blower Lubricants have two different lines which include PneuLube ISO synthetic blower lubricant and PneuLube food grade ISO 100 synthetic blower lubricant.